I can never get over the eternal city of Rome. I walked briskly around the city, always in awe at how a busy city, hectic with the hustle and bustle of modern life, interacting in sync with all the historical sites and monuments where time felt like it stood still. Intertwined with the historical Colosseum, Bocca Di Verita and the Pantheon are fast moving smart cars and swerving mopeds. Super narrow cobblestone walkways and streets seem to lead to nowhere but suddenly opens up to yet another magical historical site. Squares, which seem to be the centre point of the maze of the short narrow passages, gives a sense of anticipation. As I watched birds taking spring water baths at the beautiful ancient squares, I imagined all the gatherings that happened there many thousands of years ago as it still does now. I was standing in the middle of an antiquated site - what an amazing feeling! Spanish Steps are just steps after all. My son wondered why we wanted to see ‘just stone steps’. However, even though I have been there several times, when I caught sight of it again, I felt a sense of amazement, just as my sceptical son did. The crowd at Spanish Steps were mostly tourists but were somehow connected and caught up with the sight and aura of the place. 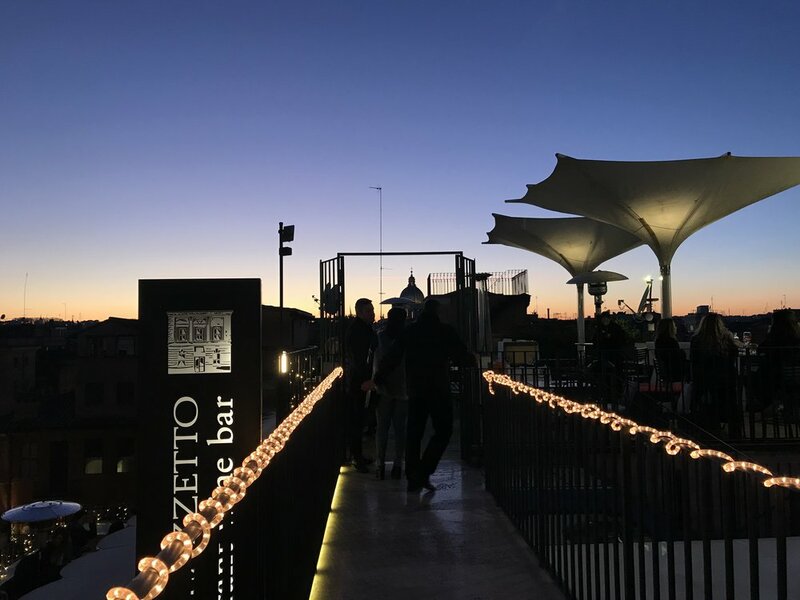 The highlight for me at the Spanish Steps this time was that we were able to enjoy a meal at a rooftop restaurant on Christmas Eve. I recall our honeymoon in the summer of 1989, Din and I had a meal at a typical Roman rooftop restaurant. I cannot seem to erase the memory of large glass bowls of ice mixed with vibrant orange-coloured peaches and velvety red plums placed on each rustic wooden tables. Appetizers of sweet chopped local summer tomatoes and basil Bruschetta, crispy squid fritti followed by freshly made tomato soup. The aroma of fresh fish, pan-fried to perfection, sprinkled with lemon zest brought vibrancy to a simple meal. A sequel to main meals and desserts which followed comforted our tummies and filled our minds and hearts with unforgettable memories! When our children and daughter-in-law joined us for this trip, we were determined to bring them to a quaint rooftop restaurant, with the hope that we will find the one that we went to 28 years ago. Regretfully, neither Din nor I could remember the location. Although the restaurant’s food presentation and service this time was not as memorable as the one we experienced during our honeymoon, the fact that we did manage to enjoy the rooftop dining experience with our family is certainly the one item I ticked off my bucket list! Nearby our apartment is a restaurant called Spaccio Pasta. The staff were exceptionally friendly. It serves the best Caprese Pizza, and the pasta choices are amazing. I could never decide which was the best. Each time I tried a new pasta, it became my favourite! In the beginning, I loved Paccheri Alla Siciliana (grilled eggplant, tomato sauce and cheese). Then I couldn’t get enough of Spaghetti Ala Carbonara Di Salmone. The Gnocchi Dello Spaccio was divine, Strozzapreti Pepperoni E Gamberi, which was bell peppers (which they called pepperoni) with prawns, was the best. My favourite list never seems to end. Well, it looks like I will have to go to Spaccio Pasta again! A shop alongside Spaccio Pasta is a gelato parlour where we dropped by literally almost every night to the point that the owner knew our favourite gelato. The freezing cold weather did not deter our enjoyment of the different gelato flavours. My son cannot get over their Nocciola Hazelnut gelato. The gelatos are made at their site, producing the most natural gelatos with the best texture and flavours - something other countries cannot seem to replicate. I miss the gelatos in Rome immensely. This gelato joint also serves the most comforting, rich, sinful Hot Chocolate. Only now did I realise that the Romans take pride in their style of Hot Chocolate. Solid quality chocolate warmed with milk and corn flour to give the creamy, custard texture. Hot Chocolate machines were in almost all cafes, stirring the hot chocolate continuously! Heavenly! When we planned our Italian trip, the one thing I was determined to taste again is the Tartufo. Din and I had regularly devoured this during our honeymoon. The Tartufo that I remembered is served in a petite terracotta pot which was a very attractive presentation. A ball of decadent chocolate gelato is coated with cocoa powder and crushed nuts. As you dig deeper into the centre of the ball, you will enter a beautiful vanilla gelato which surrounds a whole delightful cherry! I tried every Tartufo that came my way but sadly, from the beginning to the end of our trip, we never managed to find or taste any Tartufo that came up to the same taste like the ones we used to savour. Each Tartufo now had one aspect that fit my criteria, but not a single one had all the combined criteria that made my perfect Tartufo. I’m beginning to feel, that I will have to assemble my own Tartufo to fulfil my mission to get the Tartufo that I remembered and loved so well. 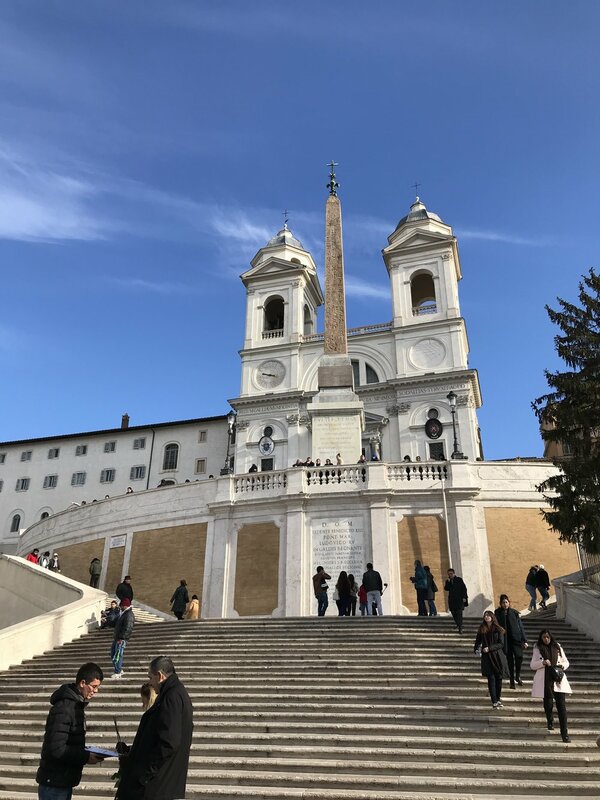 After having done much research, my daughter was determined to bring us to see and explore the most loved neighbourhood in Rome of Trastevere. The main reason for this excitement to explore it is because this place is not much of a touristic attraction, but more a local favourite. It turned out to be an afternoon walk I thoroughly enjoyed. Curvy cobblestone streets, overgrown flower creepers, quaint shops, squares and entertainment by veteran Italians singing for pleasure filled our adventure at Trastevere. Hungry for lunch, we just visited the first pizzeria that we encountered. I was amazed at the many rows of pizzas of every variety that you can imagine. La Boccaccio (not a planned choice) turned out to serve the best pizza we savoured in Rome. Mostly being a takeaway place, we ate at benches outside the pizzeria in the cold with pigeons sharing our crumbs. The surrounding was not fanciful, but it was the creepers on the walls, birds running around, the cold air, and the hot steaming pizzas with fresh toppings and perfect crisp crusts, could vanquish a five-star restaurant anytime! No holiday is complete without a tour of the fresh local markets. On an early Wednesday morning, we took a cab to the oldest, well-known market Campo Di Fiori Square. For me, it was probably the highlight of our Roman holiday. Umbrellas mushroomed the square with sellers promoting the thousands of varieties of cheeses, fresh Italian vegetables, every shape and colour of pasta imaginable, herbs of every aroma for any dish, and kitchen wares which I could carry home. It was all there. I don’t need to go to an upmarket shopping gallery when everything is available at Campo Di Fiori. After covering the marketplace, we stepped into one of the restaurants facing the market square. While savouring our scrambled eggs, next to a heated warmer, we quietly observed the activities of buying and selling at the market while sipping the delicious cappuccino. (I’m not a coffee lover until I tasted the true Italian coffee) I thought to myself, ‘If I choose how heaven is to be, this would be it.” I am happy here, doing just this. 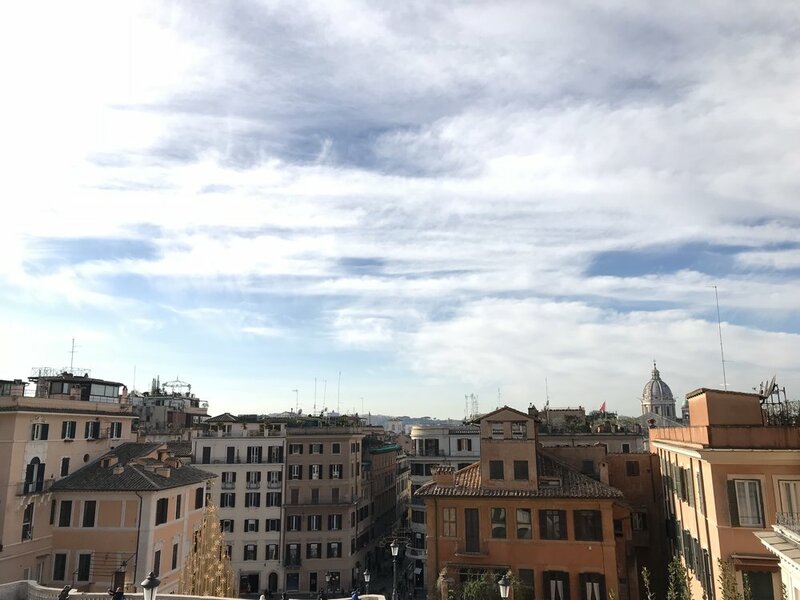 From the 1970s, when I first visited Rome, followed by my 1980s and 1990s visit and our recent travel in December 2017, Rome has not changed. Even my excitement to see it, again and again, has not diminished. I knew that I loved Rome, no less than I did over 35 years ago.